If the thought of SEO makes you feel a little terrified, I’m going to change all that for you right now! 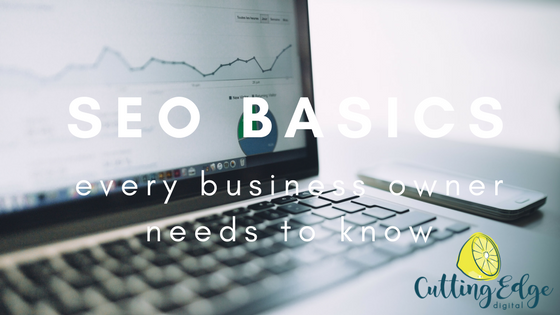 I’ll teach you some of SEO basics every business owner needs to know, and with a little bit of knowledge and effort, you too can get your website ranking on Google! Firstly, SEO is not dark magic. SEO is not hard. SEO is not impossible. It’s also not quick. It’s never truly done. It is constantly evolving and you need to evolve with it. You need to decide straight up if you want to invest time and effort to DIY or if you want to invest money and pay a professional. Both have pros and cons so it’s up to you to decide which route to take. So you’ve built your website but you aren’t showing up on Google. What next? The FIRST thing you NEED to do after creating your website is install Google Analytics. It is not a nice to have – it is a MUST have! Google Analytics will help you see who comes to your website, how long they spend, what pages they visit, where they are from, what age they are, what keywords they searched when they found your website and so much more. The process is very easy and they have step by step instructions. If you are on WordPress, I recommend installing the Google Analytics by Monster Insights plugin to add your tracking code to your website. DO NOT use more than one plugin for Google Analytics and check with your developer that they haven’t already added it in the code. Having 2 or more versions of Google Analytics tracking code on your website will mean your visits won’t be properly tracked (a good indicator you have more than one GA code on your site is a very low bounce rate – under 10%). If you want to make sure Google knows about your website, instead of sitting around praying to the Google gods to find your website, you can submit it in Google Search Console. You can do this here. Add your website twice – one with www and one without www – this is so you can set which version is your preferred version. You can check this by visiting your website and copying the URL onto a Word document or email. Does it appear with or without the www’s? That’s your preferred version! If you have Google Analytics installed (which you better had! ), use the Google Analytics option to verify you own the site as it is the easiest way to verify. Once you’ve added both versions to Search Console, go into your preferred version. From here, you need to submit your sitemap which tells Google what pages you have on your website. You can submit your sitemap under the Crawl/Sitemaps menu option. Make sure you connect your Search Console account to your Google Analytics account – that way you will be able to see Search Console data in Analytics, such as the search terms people have Googled to find your website. If you want to know if your website is indexed by Google (i.e. that Google knows your website exists), go to Google and type in “site:[your URL]”. If nothing appears, you’re website isn’t indexed. If your pages appear as search results, it is indexed. Now you’re ready for the fun stuff! One of the key elements of SEO is keywords. Every page on your website should be optimised for at least one specific keyword. But how do you know what keywords to use? There are some free keyword research tools available but most are paid unfortunately. 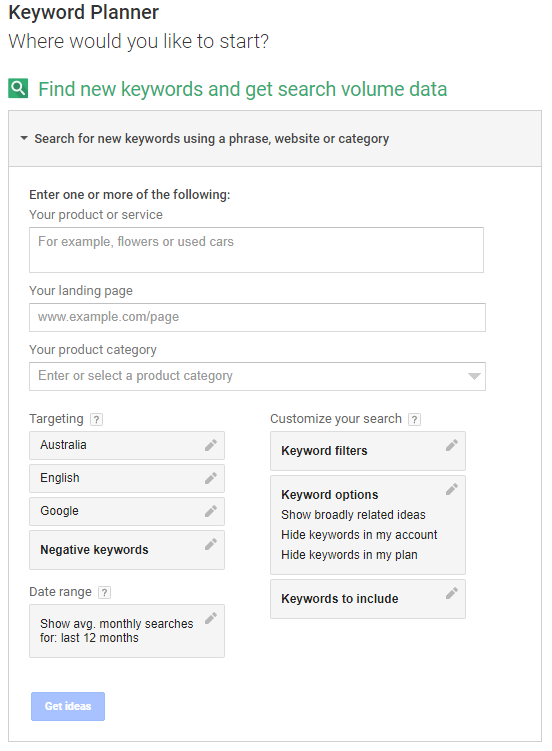 Some options are SEMRush (limited free account or paid account), MOZ (paid), Keysearch (free trial then paid) Google AdWords Keyword Planner (free if you have an AdWords account, but data will be broad if you aren’t paying for ads). Other free places to look are Answer The Public and Google itself. Google what your main products and services are, along with a location keyword – e.g. Virtual Assistant Perth or Catering Company Sydney. See what results appear on Google, what appears in the drop down box as you type, and also check the ‘Searches Related To’ section which often appears at the bottom of the first page. 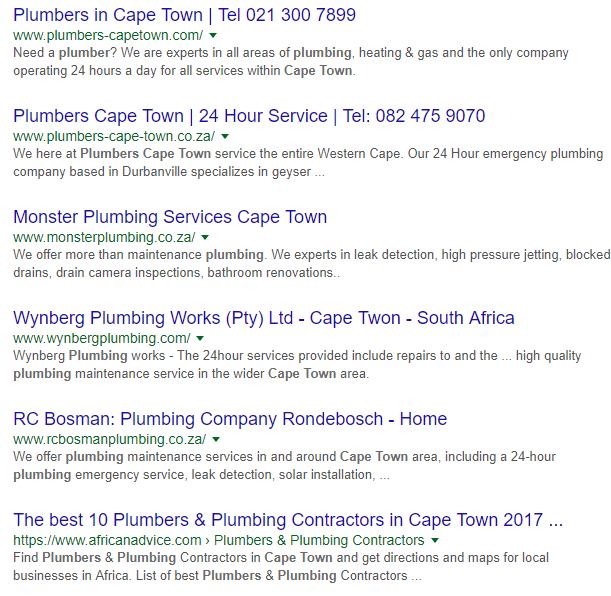 You can look at what keywords your competitors are targeting as well – these are the blue headings in the search results. Pick at least 1-2 keywords for each page of your website but make sure they are relevant to the content of the page as well. You want to try and use keywords that people are actually search for (that have search volume) but that aren’t ridiculously hard to rank for (that are low competition). Now that you’ve found your keywords, you need to write your title tags and meta descriptions. Add breaks in between your keyword phrases, as shown above, to tell Google when one keyword ends and another begins. If you’re using WordPress, download the Yoast SEO plugin. Walk through the set up first. Then on each page and post on your website, there will be a Yoast box under the page content. Insert your title tag and meta description in the fields and update the page/post. So you’ve got your title tags and meta descriptions – amazing! Now you need to work those keywords into your page content. Having a keyword in the title tag, meta description AND the content of the page, tells Google that your page is definitely about that keyword. This makes it more likely for Google to choose your website to show as a search result when someone searches for that phrase. DON’T stuff your content with the keyword a million times –that’s a bad signal to Google. Write naturally. DON’T add hidden keywords, for example white text on a white background that no-one except Google can see. That’s just spammy and Google will see right through it. DON’T create a million separate pages for every suburb you are trying to target, e.g. graphic designer Subiaco, graphic designer Nedlands, graphic designer North Perth, graphic designer West Perth, etc. And for a bit of fun and inspiration, chuck your URL into this baby and see how it makes your website sound all gangsta! And click Gizoogle Dis Shiznit! And if all of this sounds waaaaaaaayy too complicated or you don’t have the time or energy to wrap your head around SEO, contact me today to chat about how I can do all of this for you!